With so many fitness gadgets on the market, it’s a nightmare to know which ones to buy. I recently came across a very interesting concept and my husband and I have been testing it out for a little while now. It’s called MyZone and is a heart rate tracker with a twist! 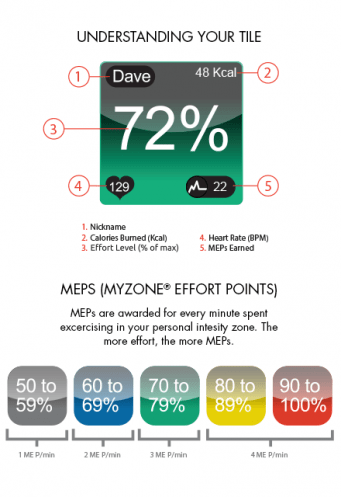 As with most fitness/ heart rate trackers, there’s an app that displays your facts and figures, but with My Zone, there is an interesting points system (MEP’s – MyZone Effort Points) which creates a real competitive side. My husband and I have been trying the MyZone out whilst doing our runs and exercises. Clearly fitter than me, he becomes quite competitive against his personal best scores. One really great feature of MyZone is how great the social side to it is. You can create your own leagues and compete against your friends and fitness buddies. It’s a great gadget if you run a fitness club and want to introduce a friendly but competitive way for your members to train and compare their stats. The MyZone MZ-3 is worn under clothing and is completely inconspicuous. This means that you don’t just have to use it for workouts. It’s a comfortable fit and if you’re a woman, you can pair it up with one of the MyZone Bras, where you remove the MZ-3 from the strap and attach it directly to the bra. This makes it even more comfortable to wear. Connecting to the app is pretty easy. Once you’ve heard the connected beep, you’re good to go. Even if the belt isn’t attached to the app at that moment, the belt will still be recording your vitals. It will then update everything once re-connected to the phone, so you don’t have to train with your phone. The tile on the app shows you all the information you need to know like calories burned, effort level, heart rate and MEP’s earned. It’s such a clever device and so easy to use. My husband, especially, is hooked on the MyZone and it has really helped him get fitter and work more efficiently with his workouts. For me it’s a great way to track my progress and to note down how changes to my workouts affect my progress. The battery when fully charged will give you up to an amazing 300 hours between charging and it can be used with iphones from iphone 5 and above and also Android phones 5.0 and above. To spend that amount of money on a mobile and digital product such as this means that it has to have credentials far beyond anything that mobiles could handle, as well as the other popular products on the market such as the fitbit, which is far more famous. It’s got a great battery life, too. A great aspect (although not unique) of this product is the social aspect, and that’s really what is going to be popular in the future in these markets. Mobile technology is big business and I’m excited to see where it moves next.